Call to inquire and schedule your appointment today! Your Invisalign treatment will consist of a series of aligners that you switch about every two weeks. Each aligner is individually manufactured with exact calculations to gradually shift your teeth into place. Invisalign is versatile and helps correct a number of dental and orthodontic issues. Our doctors will work with you to create a custom designed program that will treat your specific problem. All you have to do is schedule your initial consult to find out how Invisalign can change your life. Customized: Every aligner is customized to your mouth with personalized impressions that the doctor will take. Effective: You are able to start seeing how well Invisalign works before completion. Removability: You can remove your aligners to eat, drink, brush, floss and for special occasions. Comfort: Invisalign aligners are smooth so that there are no rough edges or wires sticking out to irritate your cheeks and gums. 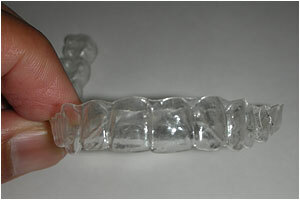 Clarity: Invisalign is virtually invisible so that no one even knows you are wearing them. Invisalign lets you live your life. The benefits are endless. To help you understand how Invisible lets you live freely and enjoy your day to day activities schedule a consult and be on your way to changing your life.